Reading has its benefits as it opens up the world for the reader, but when the reader is dyslexic the gains obtained from reading are much less and the world is not so accessible. So far, this blog has talked a lot about living with dyslexia, but it been rather quiet on the subject of travel even though Dysconnect is about dyslexia and traveling. For our family, we believe travel and experience is a way to open up the world whether it is local, national or global. This time of year we’re limited by school calendars but, as I hinted in my post “A Cloud on the Horizon – visual stress,” travel is happening in July 2011! Just as we are beginning to see a few signs of spring here in Massachusetts, so a few signs of summer travel are visible too. This summer we are venturing beyond the Western world that we know so well and into a very different culture. Flights are booked – from New York to Hong Kong to Beijing to London and to Boston – an around the globe trip to visit relatives on a two-year work assignment in China. Guidebooks are scattered across the dining room table, web pages are bookmarked on the laptop, flight confirmations are printed, sticky notes remind us to get visa photos taken and passports are stacked in a corner on the kitchen counter. Up-to-date guidebooks are hard to find and usually do not seem good value for money, plus they are like lead weights in baggage when weight allowance is precious. 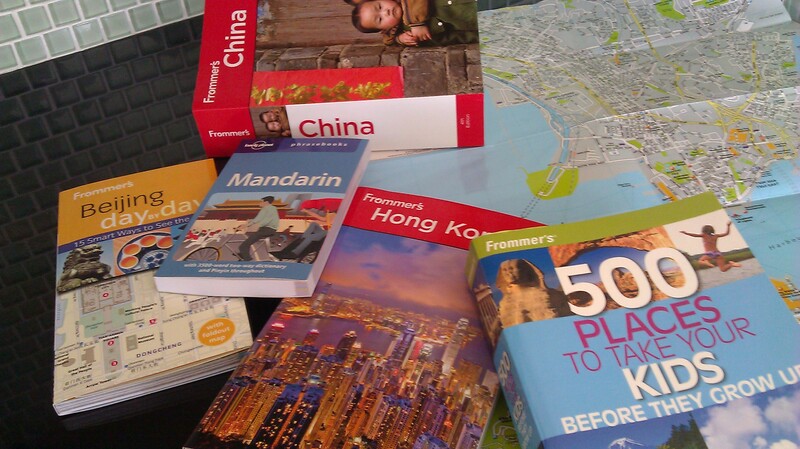 But with many dollars worth of Borders gift cards from our Gabrieli Lab research participation, I’ve found up-to-date Frommer’s China, Frommer’s Hong Kong and Frommer’s Beijing Day by Day published in 2011. Not only are they up-to-date but our relatives already in China and Hong Kong have relayed experiences that corroborate Frommer’s information. So, with guidebooks in one hand and laptop within reach of the other hand, I’ve been trawling the hotels of Hong Kong and Beijing. Language, food and local customs will be just a few cultural shocks for us on this trip. Western brand hotels are perhaps the place where we can guarantee some familiarity if we need it. This lodging also allows us to use hotel points instead of dollars and reduces the risk of turning our educational investment into a financial nightmare. For two evenings I’ve clicked through hotel reviews on TripAdvisor, maps on Google Earth and hotel web sites. I’ve compared the percentage of “excellent” and “very good” to “poor” traveler ratings on TripAdvisor and considered location, location, location in my decision-making. After intensive evaluation, I have booked four nights for a family of five in Beijing!